I’ve been wanting to share this lunch idea for awhile. I started making this a few months back, when I had no time and no food in the fridge, but craved something warm (with the winter months). Ironically, I woke up at almost 8AM today (I think I might be getting this flu that’s going around) and had no time (or energy) to whip this up. Because it seriously takes, like, 5 minutes or less. And, you don’t have to, but you can heat it up. Which is always awesome. When you have no time to make lunch, but still want to eat something healthy, packed with protein and warm. Spread a few tablespoons of hummus onto the tortilla. Sprinkle some chunks of goat cheese on top. Lay down the deli meat (I prefer turkey). Wrap up and put in a Ziploc. Take lettuce, wash/prep as normal and place in a Ziploc. When ready to eat, take wrap out of bag and heat up in the microwave (about 25 secs). Unwrap just enough to stuff your lettuce in. 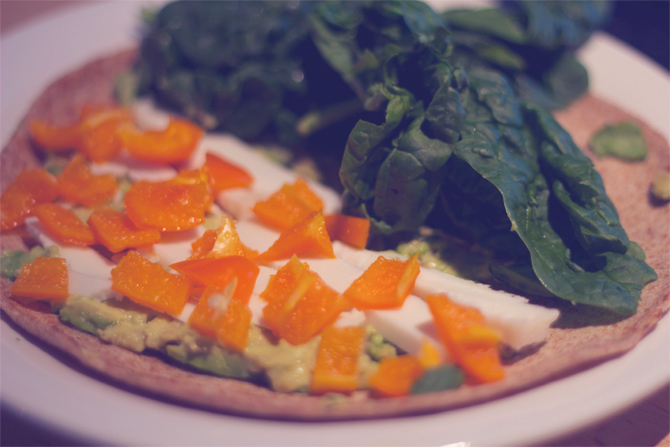 Wrap back up and enjoy the melty, protein-packed deliciousness! What’s your go-to packed lunch-on-the-fly? I was roaming the halls of our local Whole Foods the other day, looking for the essentials: wine, almond milk, organic eggs, you know. Well, lucky me, lobster tails were on sale for $8.99/2 tails! No I have never cooked a lobster or lobster tail before, but heck, lobster is delicious and at that price? Why not. The trick was making a meal that incorporated the lobster tails without making them the main meal since…two small lobster tails wouldn’t fill anyone up. But something Ryan and I always see on menus is lobster mac ‘n’ cheese, which is ah-mazing, but also ah, full of carbs. And I’m not anti-pasta by any means, but after eating potatoes what feels like all week last week, I needed a break. Thank Baby Yeezus for quinoa. 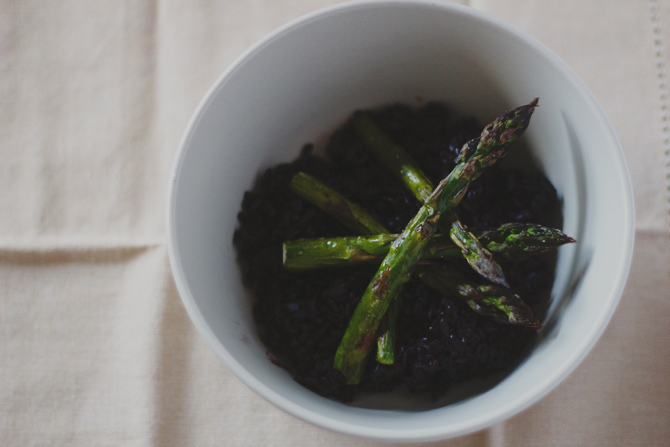 This recipe is delicious, healthy and…delicious. 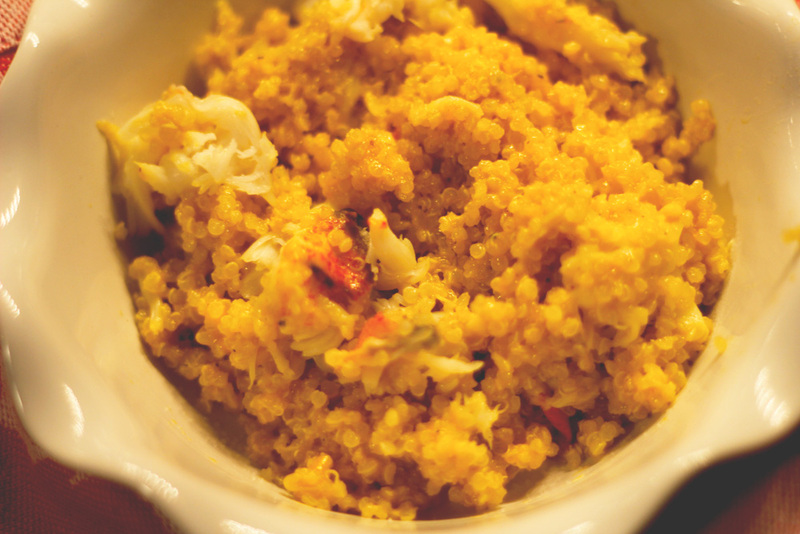 Your boyfriend/husband/dinner buddy will probably love it, even if quinoa usually scares them because it’s that delicious. Plus, it’s fast. I argue, if you prep the quinoa ahead a time like I did, it could rival a Kraft Macaroni situation. Don’t those looks like little nuggets of gold? They basically are. Turns out lobster tails are easier to prepare then I thought too. I mean, I’m sure there are a few different ways to prepare it, but I found this way to be the easiest. I was low on bay leafs (aka I couldn’t find mine) so I subbed a few other spices, and it turned out completely fine. I think the seasonings are optional anyway (at least for this recipe). 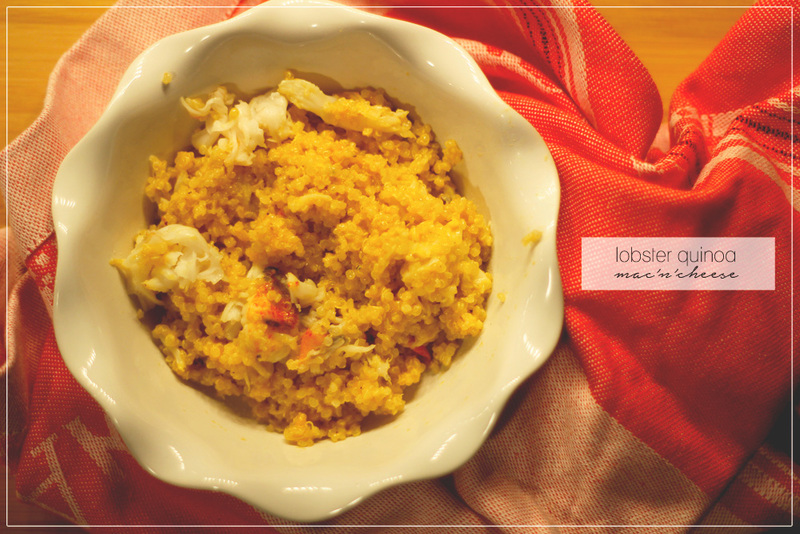 Healthy, gooey and delicious cheesy lobster quinoa. Perfect for a decadent lunch or dinner! Once lobster tails have cooled, take out their meat. Set aside. In a pot, add quinoa, almond milk and 2 tbsp ghee and turn on medium heat. Stir. Once quinoa is hot, add one cup of cheese. Stir. Add second cup of cheese and seasoning, Stir. Add lobster meat and more seasoning or ghee, if preferred, and you're done! It’s Friday! Friday! Woohoo! Another week is over, and it’s time for the weekend! My weekends have been packed recently. Like, majorly. For example, tonight I’m seeing Fault in Our Stars (hope it’s as good as the book! ), tomorrow I leave at 8AM to road trip back home for my 2nd dress fitting, followed by some fabric shopping and crafting and then topped off with Father’s Day on Sunday and road tripping it back to Chicago. Part of me can’t wait until my weekends are a little slower and I can go to the art fairs (missing one this weekend) and farmers markets (also missing it this weekend). Le sigh. Oh well, still good things. Speaking of good things, this quesadilla is delish. Or is it a quesadilla? I always get those tortilla meals mixed up. Either way, this is our go-to recipe on nights where I can’t think of anything else to make. 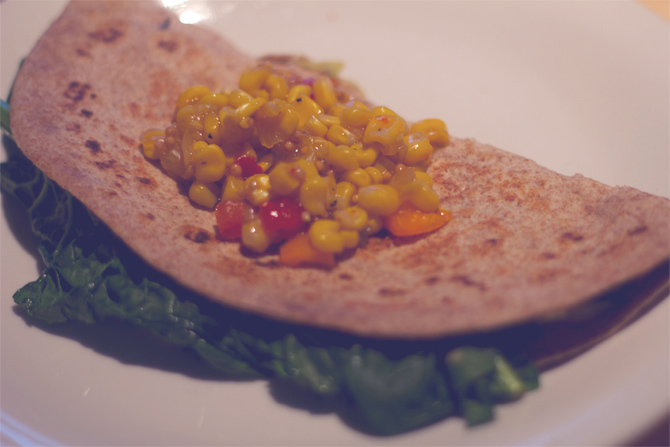 Ryan has always had his cheesy quesadilla, which has always left me scrounging for leftovers since I could never think how to make my quesadilla…a tad healthier. Well, this is the ticket! I had some leftover avocado, baby bell peppers and new spinach! Plus some Trader Joes corn salsa on top. So easy to make. So yummy. So many veggies and good things! 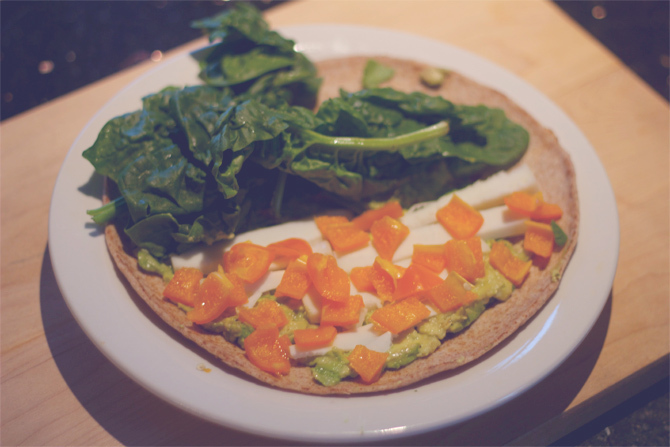 Spread the avocado on the tortilla on one half of the tortilla. Top with cut up baby bell peppers. Sprinkle a bit of salt and pepper. Add spinach to other half of tortilla. Spray pan with olive oil cooking spray and heat. Add tortilla, face side up. Then, fold over. Heat one half and, carefully, flip. Cook until tortilla sides are golden brown. I’ve always loved rice. More than pasta. More than crackers. More than bread…not even kidding. It’s just so versatile! Sadly though, rice has always = carbs. 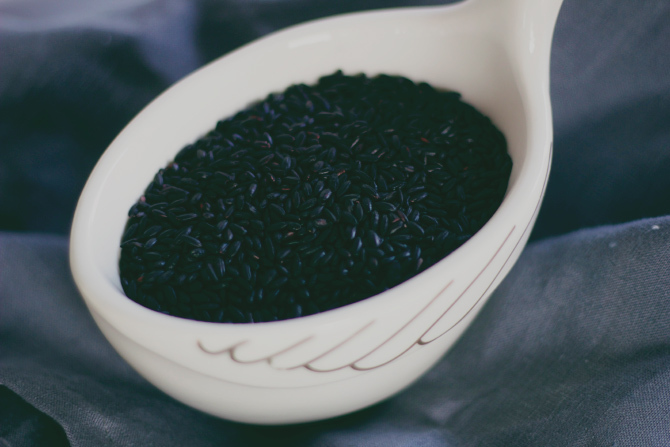 Until I found black rice; this new “it” superfood. 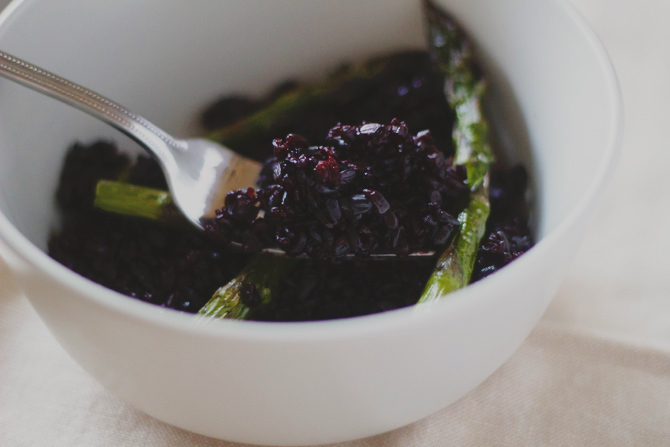 Black rice also may prevent other serious illnesses, like Alzheimer’s, diabetes and cancer. Obviously, this is my new rice of choice (sorry amaretto). Plus, it’s uber easy to make and has a soft, somewhat nutty texture that blends well with a variety of veggies. I just followed the directions on the back of the bag (I purchased a bag of Nature’s Earthly Choice). 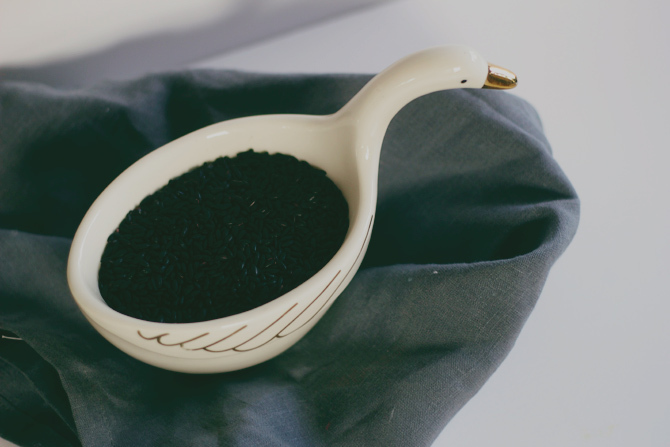 It’s basically the normal way to make rice, just with the added step of rinsing the rice before cooking to get some of the “purple” color out. 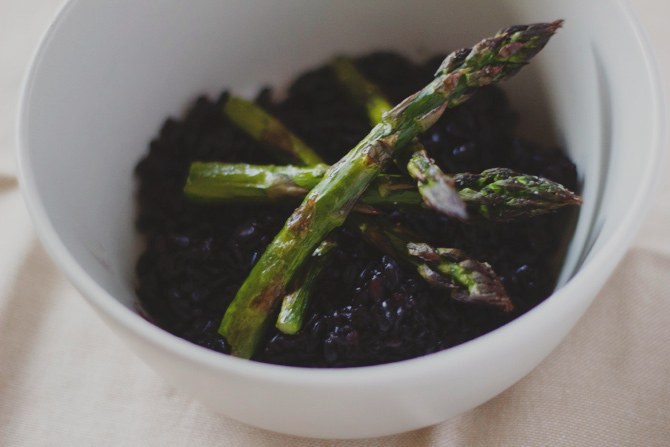 I also made some asparagus using my fav Giada recipe, threw it in with black rice, a bit of salt and pepper, and boom. Lunch is served. P.S. Hope you have great weekend! I’m headed to a concert in Milwaukee tonight, followed by garage sale hopping, dress fitting, gardening and circuit training on Saturday and my sister’s college graduation Sunday. Busy weekend for me! Enjoy yours, and let’s pray for some sun!